LITTLE ROCK, Ark. (KTHV) - Mayoral Candidate Frank Scott Jr. called for a press conference on Friday after he said the Little Rock Fraternal Order of Police used a picture taken out of context to make unfair claims that he does not support local police. In the photo, Frank Scott Jr. is pictured with Roderick Talley, who is currently suing the Little Rock Police Department. The guy on the left is Frank Scott Jr. who's running for Little Rock Mayor. The guy on the right is Roderick Talley. Tonight, Talley is running from law enforcement after fleeing the Cross County Cort House and hitting a Deputy Sheriff with a car. Tell the guy on the left to help us find the guy on the right who's publicly supporting his campaign. The Little Rock Fraternal Order of Police want the citizens of Little Rock to know that candidates who align themselves with fleeing felons fail the qualifications for any public office. The LRFOP has publicly endorsed Baker Kurrus for Little Rock Mayor. We ask for your support and vote for Baker Kurrus during the upcoming runoff elections December 4th. Man suing LRPD claims he was 'set up' after allegedly hitting deputy with car in Cross Co. 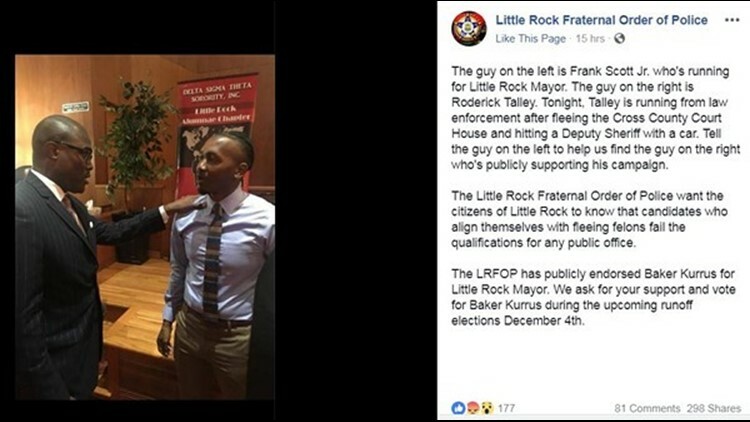 Since that picture was posted to the Little Rock Fraternal Order of Police Facebook page on Wednesday, it has been taken down, but board members say they stand behind their endorsement of Mayoral Candidate Baker Kurrus. "We were trying to make a connection and it went down race lines and that was not the intent for us to go,” said John Gilchrist, President of the Little Rock Fraternal Order of Police. “We want this community as united as everybody else does." Gilchrist said Frank Scott Jr. has failed to communicate with local law enforcement when it matters the most, including his recent call for an investigation of the Little Rock Police Department by the U.S. Department of Justice. “A periphery of him pointing fingers at law enforcement to gardener a segment of the vote that does not support law enforcement,” said Gilchrist. Scott Jr’s opponent, Baker Kurrus did not comment on the social media post but said he believes the FOP is simply endorsing him due to his previous experience in leadership roles. “I think the FOP and the city as a whole wants change, they want someone in the office that is going to be engaged and change the way we operate things from the top down,” said Kurrus. Scott Jr. said although the post has caused some tension, there is still time to fix it. "I think the damage has been done, but there's a great opportunity to repair that damage,” said Scott Jr.